There are many commercial businesses that require custom doors different purposes. When it comes to supermarkets they require a number of different types of doors in each different store for different reasons. They have different sections of the store that include cold areas, areas with a lot of traffic from employees and delivery areas where vendors are dropping off perishable items. Supermarkets tend to run on very small margins for profit so anywhere they can save money is a benefit. By using the correct doors to control the temperature of cold areas, supermarkets will realize the benefits of energy savings and other benefits as well. From the independents to the national chains, more grocery stores use traffic doors, cold storage doors and strip doors because they understand the value in maintaining an efficient, cost effective solution as they continuously move products to the shelves. Supermarket doors from Discount Commercial Doors can stand the abuse from stock boys to bread racks, dollies of milk to produce crates. Due to different areas of a supermarket, different types of doors are required. The following are some of the types of doors used in supermarkets. Impact Traffic Doors: Traffic Doors also known as swing doors, impact doors and double acting doors, are a cost effective solution for fast and efficient, two-way movement through an opening where visual, sound and environmental barriers are required. Air Curtains: An air door or air curtain is a device used to prevent air or contaminants from moving from one open space to another. The most common use is a downward-facing blower fan mounted over an entrance to a building, or an opening between two spaces conditioned at different temperatures. Air Curtains are high velocity units designed to prevent insects from entering kitchens and other service entrances. Cold Storage Doors: Cold storage sliding doors feature a heavy duty FRP framework, heavy duty track system with anti-up thrust roller assembly and molded polymer casings. These “best in class” features all come in either manual or motor operated systems. Cold storage doors are available in single and biparting doors for both cooler and freezer applications. Flexible doors are a cost-effective way to provide a swing door in openings for heavy traffic applications. Top mounted gravity-operated hinge system allows the door to open fully and close automatically, allowing easy access and conserving energy. These doors are easy to install and virtually maintenance free. 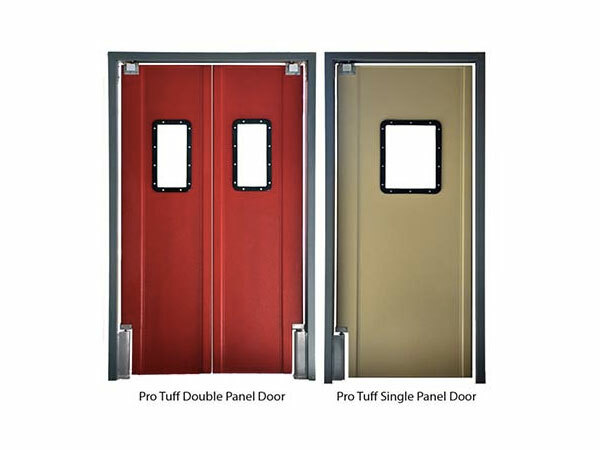 Discount Commercial Doors provides the broadest range of doors, a reputation for outstanding reliability, durability and long term value. We have unmatched service and support with the largest customer service organization in the traffic door industry. Discount Commercial Doors knows and understands the importance of specifying the right door… that’s why Chase has more field representatives strategically located for on-site assistance than any specialty door company. To learn more about our doors please call us at 800.543.4455.